Honor the sub-brand of Huawei has launched the Honor 8A Pro is Russia. 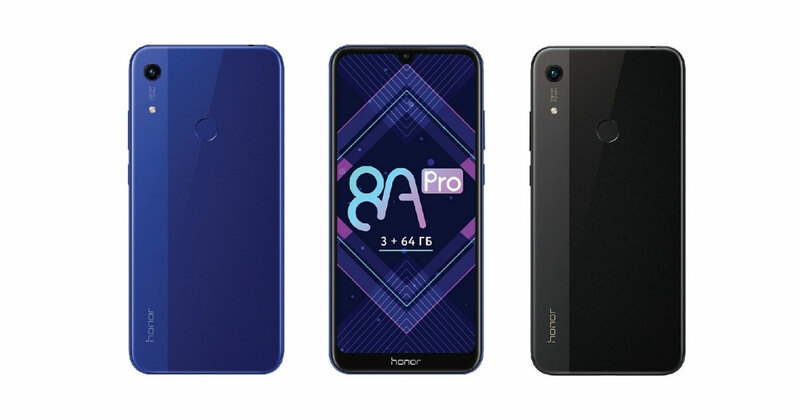 It seems like the Honor 8A Pro is the Russia-specific variant of the Honor Play 8A which was launched in January 2019 in China. The smartphone runs on Android 9 Pie, flaunts a 6.09-inch HD+ screen, and get the power from the MediaTek Helio P35 SoC. given below is the details of the Russia-specific variant Honor 8A Pro. The Honor 8A Pro comes with a price tag of RUB 13,990 i.e. around INR 14,700 and just for today, it will carry a price tag of RUB 10,912 i.e. approx INR 11,500. The smartphone is already on sale from 12th April 2019 through Tmall in Russia which makes it the first market to get the Honor 8A Pro. The Honor 8A Pro is available in two color options- Blue and Black. The company has not said a word about the launch of the smartphone across world including India. The Honor 81 Pro flaunts a 6.09-inch IPS HD+ with a screen resolution of 720 x 1560 pixels along with an aspect ratio of 19.5:9 and 283 PPI. Under the hood, the smartphone carries an octa-core MediaTek Helio P35 SoC with four Cortex-A53 cores clocked at 2.3GHz and four Cortex-A53 cores clocked at 1.8GHz, along with the PowerVR GE8320 GPU which is mated with 3GB of RAM and 64GB of onboard storage that is expandable up to 512GB using a dedicated microSD card slot. In terms of the optics, the Honor 8A Pro comes with a single rear camera i.e. a primary 13-megapixel camera with an LED flash and an f/1.8 aperture. At the front, the smartphone carries an 8-megapixel shooter for selfies and video calling. The Honor 8A Pro runs EMUI 9.0 based Android 9 Pie. The smartphone comes with a dual-SIM (Nano + Nano) slot. It also includes a capacity of 3,020mAh battery. The dimension of the phone measures 156.28 x 73.5 x 8mm and weighs 150 grams. If the connectivity options are to be seen, the smartphone includes 4G LTE support, Bluetooth 4.2, Wi-Fi 802.11b/g/n, and a Micro-USB 2.0 port. The Honor 8A Pro comes with GPS and Glonass support. For security, the smartphone has a fingerprint sensor at the back. The difference between the China-based Honor Play 8A and the Honor 8A Pro is the internal memory and the fingerprint reader.